Among all service industries, food service has always been ranked first, and it is well received and welcomed by consumers, especially juices, cold drinks, snacks, etc. This is why more and more entrepreneurs are starting his mall food service．Today I want to introduce a multi-functional creative business juice bar kiosk , hope will be help your business . 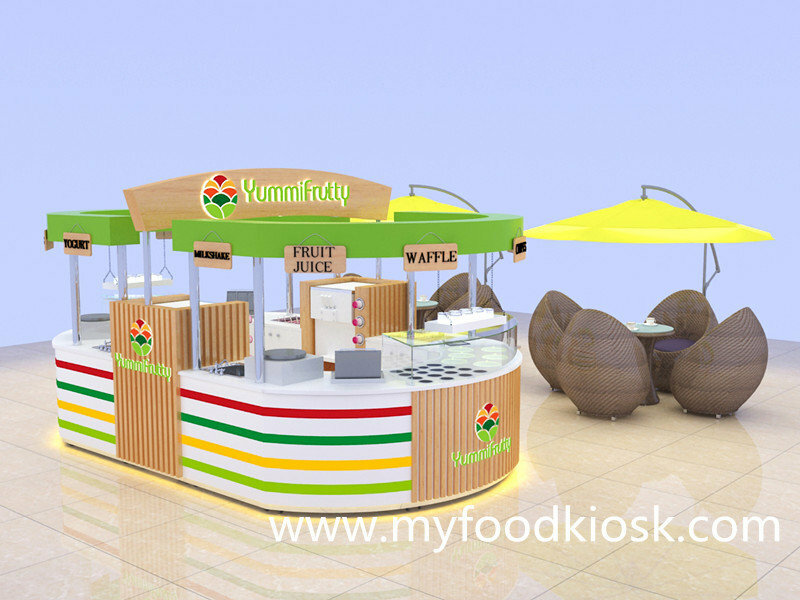 When you first saw this cabinet, I believe that you will be deeply attracted by its appearance, it is very eye-catching and high end , can for selling juice , frozen yogurt , crepe , pudding ,bubble tea , milkshakes , smoothie etc . Material : Flame retardant plywood as basic material , surface is white fire-proof plate ， with wooden batten and colorful acrylic batten decoration. green color roof match wooden grain color signs , inside with a big luminescence LOGO . You will notice the whole kiosk four sides with acrylic logo , customer can saw it from each angle ．the bottom of this kiosk with yellow led light strip. is very bright . Layout : whole kiosk is a oval shape , total size is 5ｍ length by 3m width , I have to say this is a great use of space for sales and presentation. 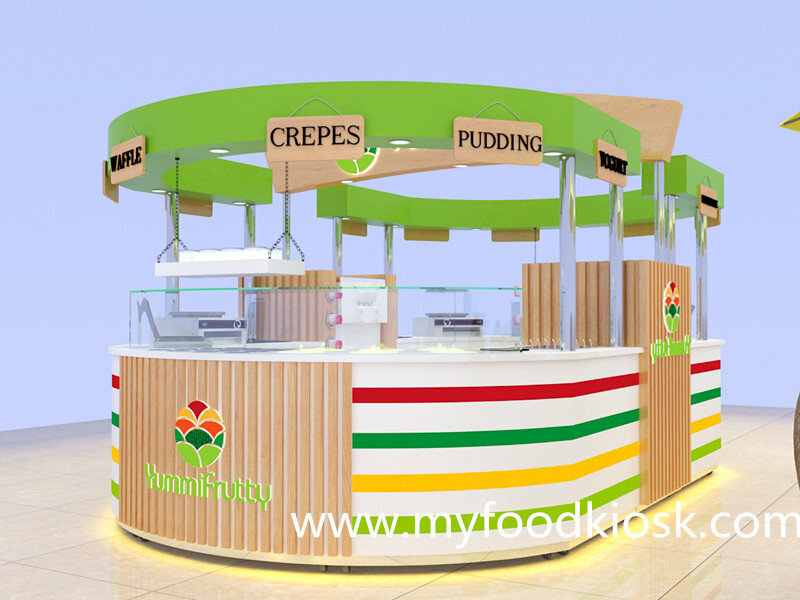 the kiosk front and back sides with arc-shaped , with stainless steel topping and glass cover , Mainly used for making different flavors of juice and crepes . left and right sides with two special 1.2m height wooden batten decoration , for hidden and put frozen yogurt machine . you can saw the right sides of this kiosk have two seats area with table and cute chair . It can provide guests with a comfortable dining environment . 2. 3D images showings .